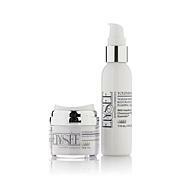 Tired of the same-old skin care regimen? 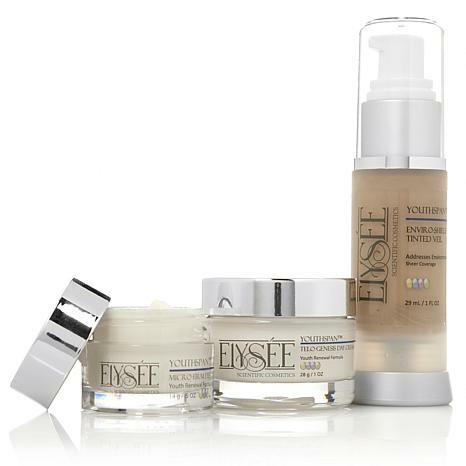 Keep your complexion looking younger than its years with Elysee's easy-to-use beauty treatment system. 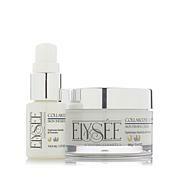 Three innovative products are specially formulated to help visibly reduce the signs of aging on your skin. Top-quality ingredients and the latest, most advanced skincare technologies combine to help keep your face looking radiant and smooth! Ingredients: Water, Chondrus Crispus Extract, Sodium Hyaluronate, MICA, Glyceryl Stearate, PEG-100 Stearate, Magnesium Chloride, Potassium Chloride, Zinc Chloride, Sodium Chloride, Lysine, Cetearyl Alcohol, PEG-40 Castor Oil, Sodium Cetearyl Sulfate, Hexyl Laurate, Decyl Oleate, PEG-7 Glyceryl Cocoate, Glycerin, Propylene Glycol, Polymethylsilsesquioxane, Nylon-6, Titanium Dioxide, Melanin, Yeast Amino Acids, Tricalcium Phosphate, Morinda Citrifolia Extract, Caprylic/Capric Triglyceride, Geranylgeranylpropanol, Citrullus Vulgaris (Watermelon) Fruit Extract, Algae Extract, Eugenia Carophyllus (Clove) Flower Extract, Stearic Acid, Thermus Thermophillus Ferment, Beta Vulgaris Root Extract, Haberlea Rhodopensis Leaf Extract, Yeast Extract, Carbomer, Butyl Methoxydibenzoylmethane, Diazolidinyl Urea, Methylparaben, Propylparaben, Triethanolamine; May Contain (+/-): Irons Oxides. 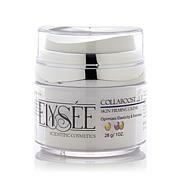 wonderful products, receive many compliments about my skin, saying I do not look my age, 69. This is the best product out there for us older ladies. It makes my skin look so much nicer. I don't expect to look like a young woman again, but it makes me look the best I can for my age. I won't use anything else anymore. I think I have finally found my skin care line! OMGoodness! What a relief to finally have a great experience with skin care and see immediate differences in my skin. 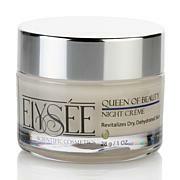 This line is truly a "sleeper" on HSN! I am thoroughly enjoying my first experience with Elysee, and if all continues to go well, I will be a faithful customer. Hurray! P.S. I think it is working for me because it is not loaded down with skin-irritating fragrances. This is my second Elysee kit and I love everything about it. I don't have much problem with my eyes, so I haven't noticed much from the eye cream, but the day cream and the Tinted Veil are perfect. I have normal skin, but noticed a difference in how well my face stays "put together" all day. The Tinted Veil seems like a strange color coming out of the bottle. Don't let this scare you. It's not coverage like you would get from a foundation, and I almost can't see anything at all when I put it on. But then after I do the rest of my makeup (I do not use foundation) my face is just glowing! I sent a photo to a friend who I saw two months ago and he asked if I used an airbrush setting on my phone!! !